Everbank has increased promotional three-month rate of its FreeNet checking account to 3.5%. Offer Details: The special 3.50% APY (annual percentage yield) is current as of 3/1/2005 and may change at any time prior to account opening. The introductory APY will apply for 3 months after account opening. The current APY as of 3/1/2005 without this special offer will be the applicable ongoing rate based on the average collected daily balance on your account and may vary after account opening. During the introductory rate period, the special introductory rate will be applied to the first $100,000 in your account and any balance above $100,000 will receive the applicable ongoing rate, based on the average collected daily balance on your account. This is a tiered rate account. Your ongoing interest rate will be determined by the average collected daily balance of your account, as indicated above. Any rate or any tier may change at any time without notice. Fees may reduce earnings. The special APY offer is good for new customers of EverBank’s National Banking Group only, and only one account per household may obtain this special APY. This account is only available through EverBank’s National Banking Group and cannot be obtained through any other division of EverBank. The full APY is paid monthly, and there is no monthly maintenance fee for the FreeNet Checking Account. The FreeNet Checking Account offers optional Web Bill Paying. The optional Web Bill Paying service is available for no fee when you maintain the minimum average daily balance for the month of at least $1,500; otherwise a $4.95 monthly fee is assessed for this service. Banking services are provided by EverBank’s National Banking Group. As such, your deposits with EverBank’s National Banking Group are combined with any you may hold at any other EverBank division for the purposes of calculating the $100,000 limit on FDIC coverage. 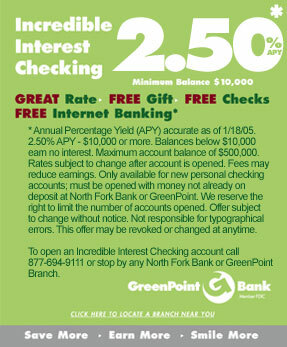 Get 2.5% checking account (for balances above $10,000). The Kids Only Savings Account offers a 10.00% APY* on all balances up to and including $500. Minimum deposit of only $1.00 makes getting started and adding easy. Balances over $500 will be paid at the Gold Savings rates. Receive an Affinity Bank Piggy Bank with each new account opened. Kids Only account opened for children up to 16 years of age. Custodians must have or open an account with Affinity Bank. Certain Restrictions and transaction limits apply. to introduce Reward Checking, the most innovative checking account in the Baton Rouge Area. $10,000 of daily collected balances and 1.01% APY* on daily collected balances above $10,000. There are no monthly fees and no minimum balances to maintain! with a high interest rate on their checking account.